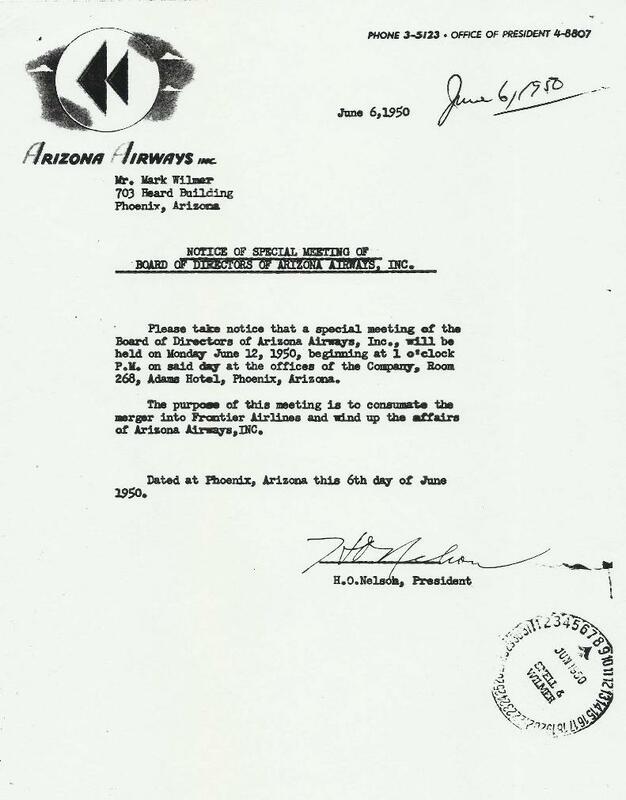 The Civil Aeronautics Board issued them a certificate in January, 1948, with an airmail contract from Phoenix to El Paso with intermediate stops. 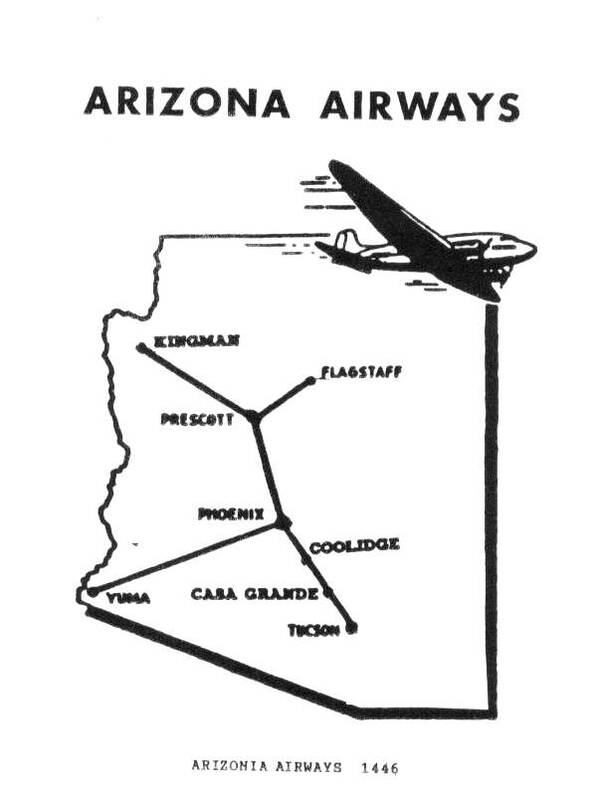 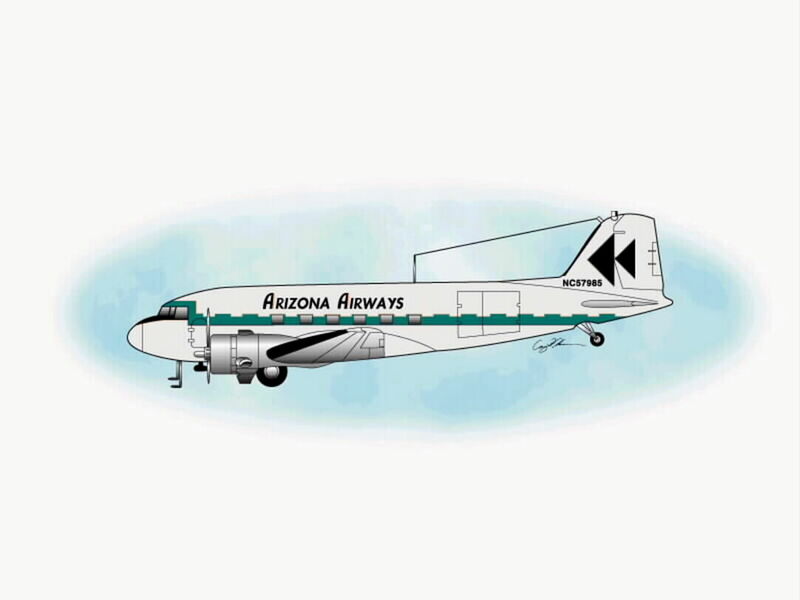 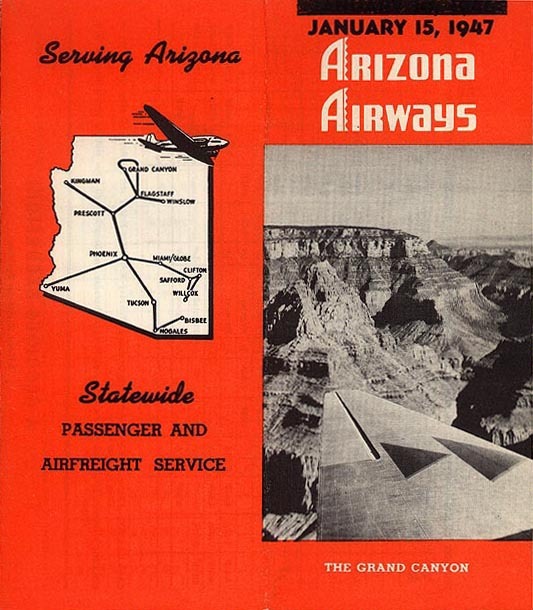 By then the carrier's finances were precarious and a merger was proposed to the CAB on June 18, 1949 to unite Arizona Airways with Monarch Airlines of Denver, Colorado. 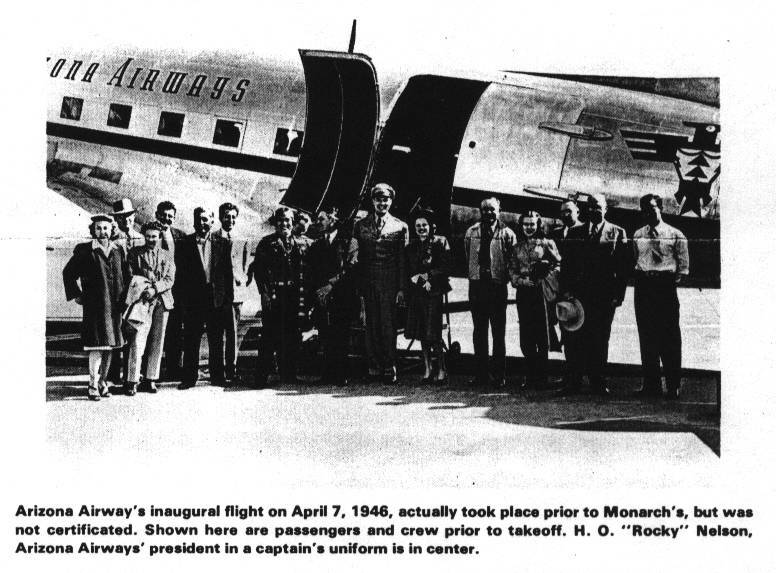 The CAB approved the merger with Monarch Airlines on April 10, 1950 which took effect June 1, 1950. 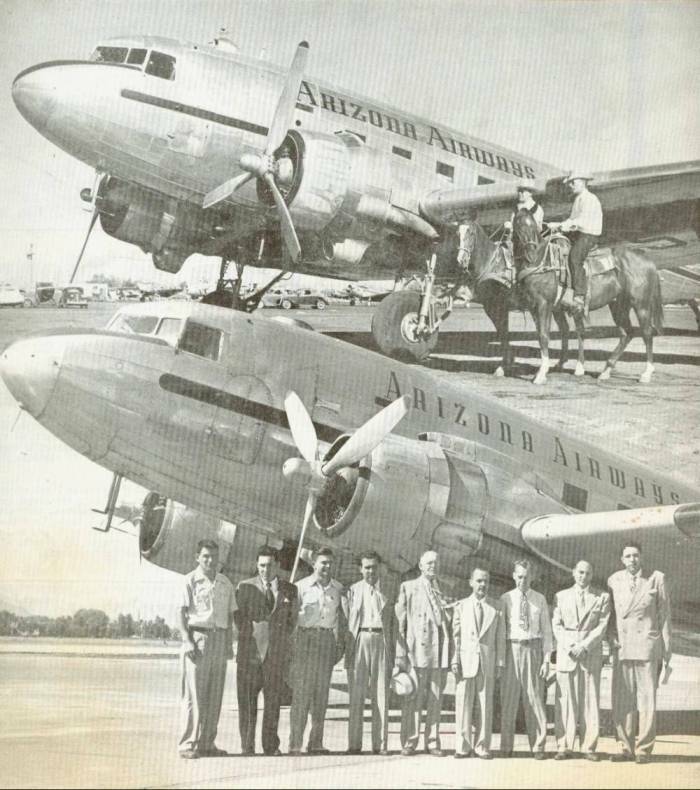 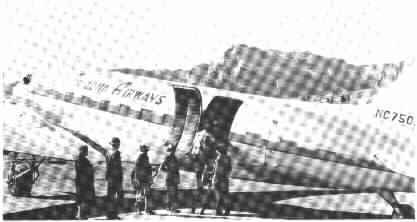 The Arizona Airways had three DC3s at the merger: N-75028, N-64910, and N-57985. 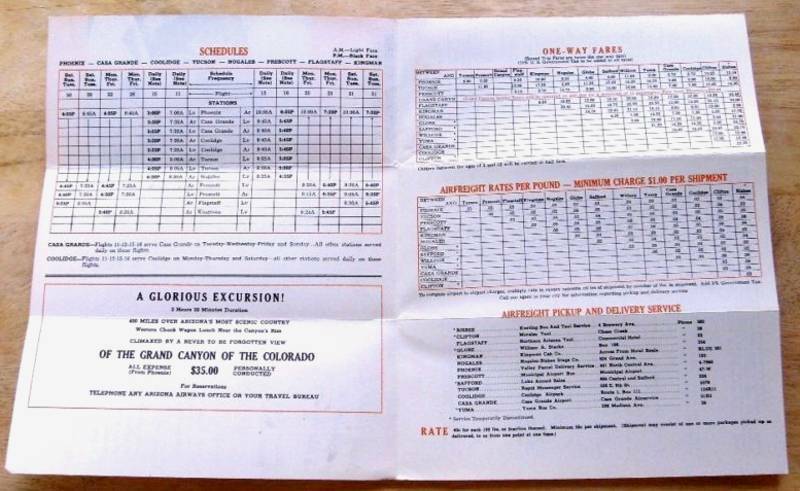 Their Sunliner names at Frontier Airlines became Teton, Williston Basin and Yellowstone. 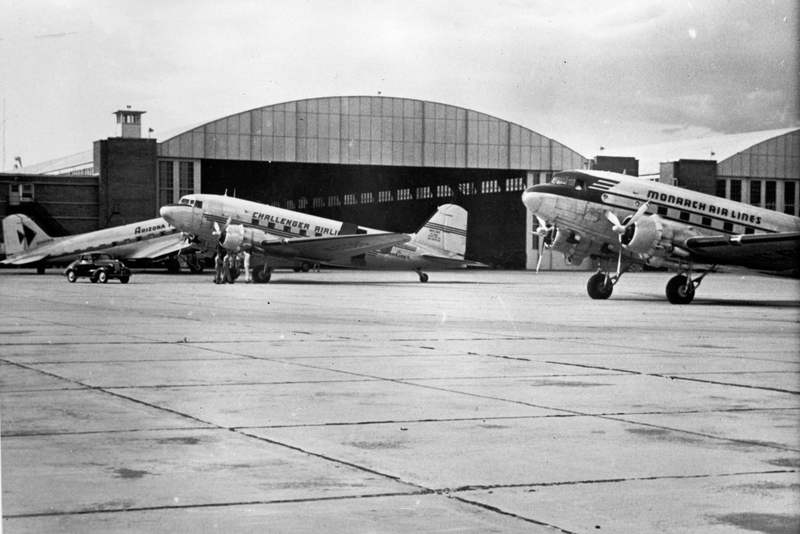 A fourth DC-3, N-75029, was sold before the merger was finalized. 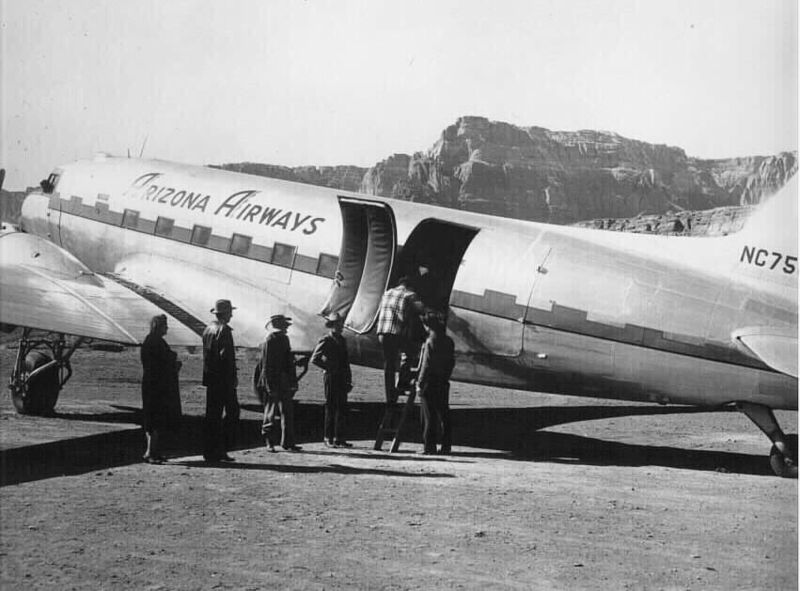 Rocky Nelson was Founder and President of Arizona Airways from its founding in 1942 until its merger with Challenger and Monarch Airlines June 1, 1950 to form Frontier Airlines, headquartered in Denver. 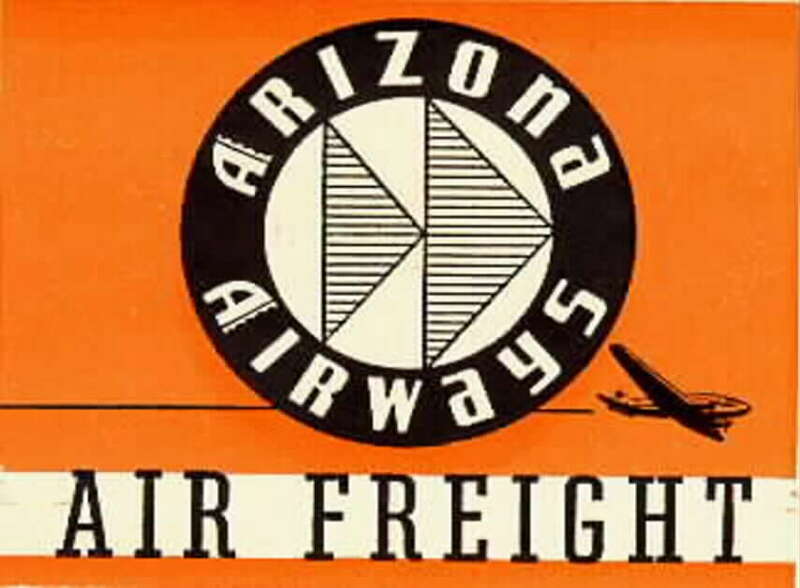 Afterwards, he was a regional vice president for Frontier Airlines. 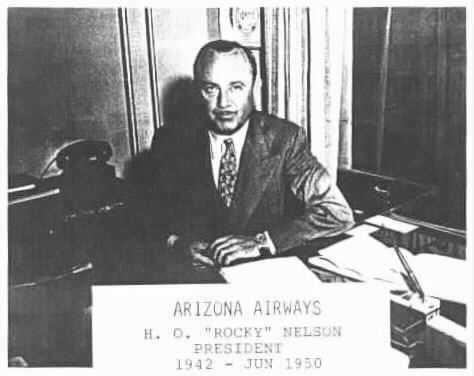 Rocky died March 6, 1951 at age 46 of a heart attack. 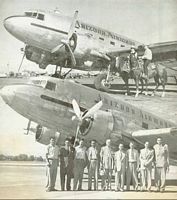 Visit his Memorial Webpage. 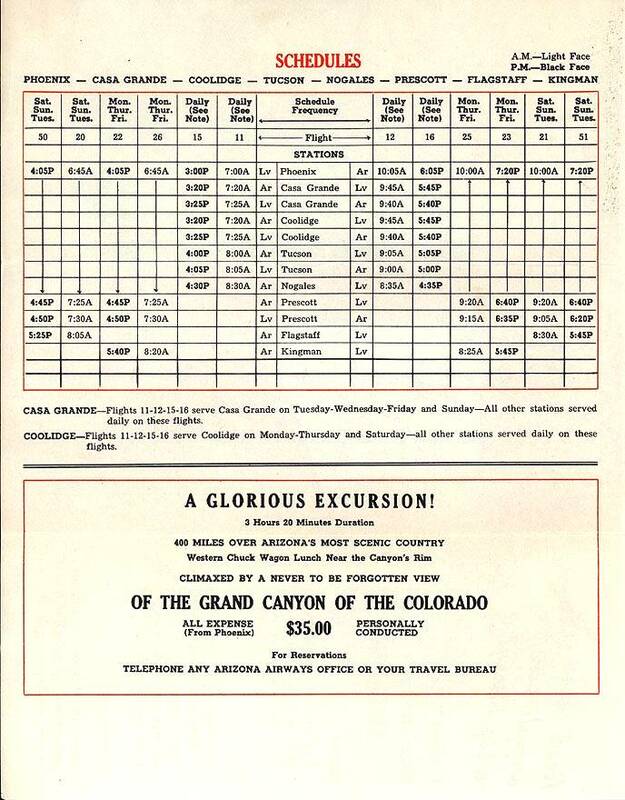 Many thanks and a tip of the hat to the archives of the Deseret News and Prescott Evening News for these articles. 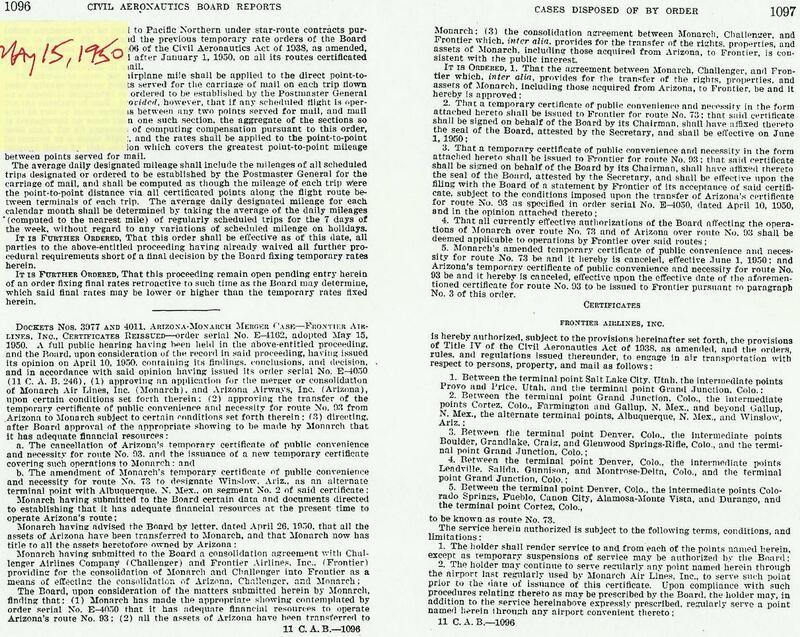 Billy Walker sent additional info. 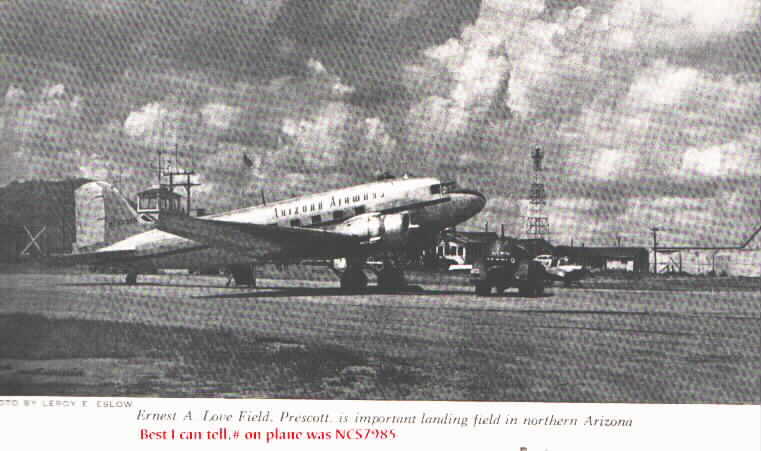 Thanks to Billy Walker, Cary Livingston, Ken Schultz, the folks at the Frontier Club for their help and Craig Hansen for the DC3 image & nameplate at the top.